Wood fiber accounts for more than 90% of the raw material used in the production of paper and board products, and it can come from a variety of sources. These sources can be slushed virgin fiber that is produced onsite, market pulp from other pulp mills, or recycled/secondary fiber. 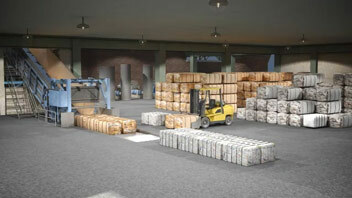 In the "recycled" fiber category, the most difficult source to process is post-consumer waste. This fiber arrives at the mill contaminated with a variety of undesirable materials, also called rejects. In this course, we will identify the sources of rejects in a recycled fiber facility, identify the types of rejects or contaminants generated, and discuss how they are subsequently processed, or "handled." 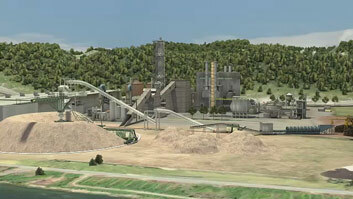 When recycled fiber is cleaned, regardless of the process, what two types of streams are created? Whenever contaminants are separated from usable fiber, the good fiber stream is called the "accepts" stream, and the contaminant stream is called the "rejects" stream. Lightweight, stringy trash migrates to the top center of vertical repulpers where it tangles together and can be continuously removed as a rope of trash by a winch called a ragger. What is a junk trap? Junk traps are relatively small chambers near the bottom of separation devices such as repulpers and HD centrifugal cleaners. They continuously collect high density contaminants and are periodically isolated from the process to discharge the collected reject material. Why are reject streams dewatered? 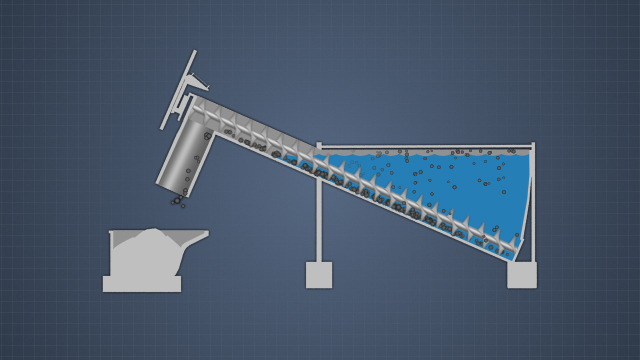 Dewatering landfill-bound rejects saves money by reducing the weight of the material to be disposed, and dewatering boiler-bound rejects increases net energy production. 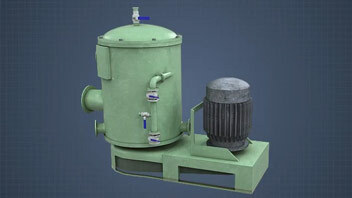 What are some types of dewatering equipment? 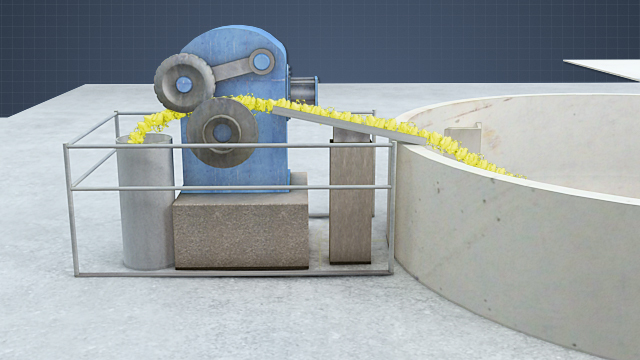 Rejects can be dewatered by simple gravity drainage, or on equipment such as vacuum belts, single and double belt presses or by screw presses. 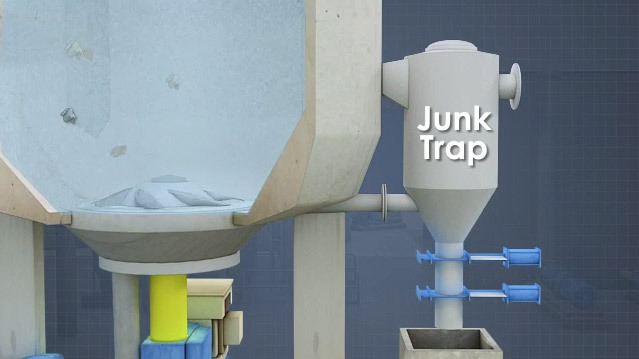 Heavy and dense materials such as rocks and metal work their way into a junk trap at the bottom of the repulper where they are periodically removed. The junk trap is a collection chamber with two valves. 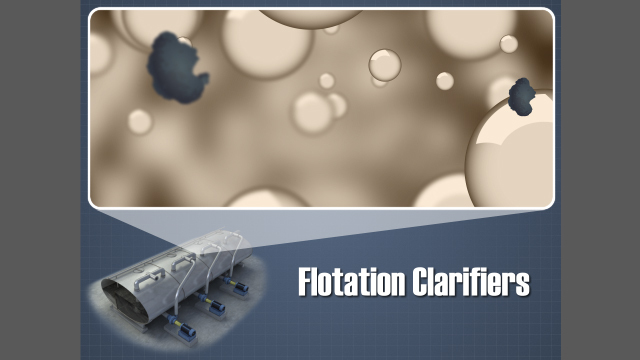 The upper valve is normally open to the repulper, while debris collects in the chamber. Periodically, the chamber is isolated from the repulper by closing the upper valve, and the lower valve is opened to release the contents. 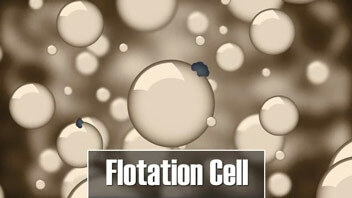 The junk trap contents may be dewatered as they are conveyed from the trap, or they may dewater in their collection bin. 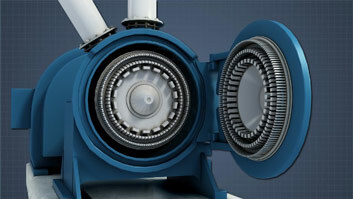 Due to its nature, after it gravity drains, this rejects stream has a very low percentage of moisture and fiber. The heavy trash is sent to landfill.